Please join Percona’s CEO, Peter Zaitsev as he presents MySQL Troubleshooting and Performance Optimization with PMM on Wednesday, May 9, 2018, at 11:00 AM PDT (UTC-7) / 2:00 PM EDT (UTC-4). 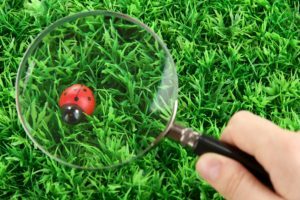 Optimizing MySQL performance and troubleshooting MySQL problems are two of the most critical and challenging tasks for MySQL DBAs. The databases powering your applications must handle heavy traffic loads while remaining responsive and stable so that you can deliver an excellent user experience. Further, DBAs’ bosses expect solutions that are cost-efficient. 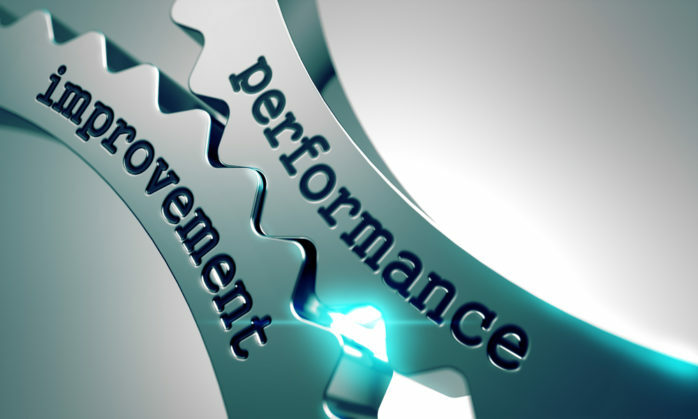 In this webinar, Peter discusses how you can optimize and troubleshoot MySQL performance and demonstrate how Percona Monitoring and Management (PMM) enables you to solve these challenges using free and open source software. We will look at specific, common MySQL problems and review the essential components in PMM that allow you to diagnose and resolve them. 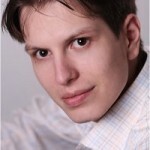 Peter Zaitsev co-founded Percona and assumed the role of CEO in 2006. 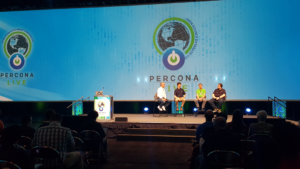 As one of the foremost experts on MySQL strategy and optimization, Peter leveraged both his technical vision and entrepreneurial skills to grow Percona from a two-person shop to one of the most respected open source companies in the business. With over 140 professionals in 30 plus countries, Peter’s venture now serves over 3000 customers – including the “who’s who” of internet giants, large enterprises and many exciting startups. The Inc. 5000 recognized Percona in 2013, 2014, 2015 and 2016. 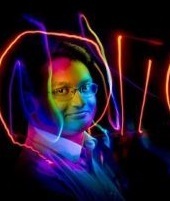 Peter was an early employee at MySQL AB, eventually leading the company’s High-Performance Group. A serial entrepreneur, Peter co-founded his first startup while attending Moscow State University where he majored in Computer Science. Peter is a co-author of High-Performance MySQL: Optimization, Backups, and Replication, one of the most popular books on MySQL performance. Peter frequently speaks as an expert lecturer at MySQL and related conferences, and regularly posts on the Percona Database Performance Blog. He was also tapped as a contributor to Fortune and DZone, and his recent ebook Practical MySQL Performance Optimization is one of percona.com’s most popular downloads. 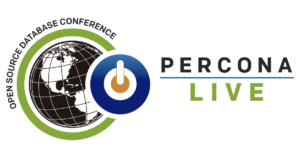 The post Webinar Wednesday, May 9, 2018: MySQL Troubleshooting and Performance Optimization with Percona Monitoring and Management (PMM) appeared first on Percona Database Performance Blog. Percona announces the release of Percona Monitoring Plugins 1.1.8. Fixed a false-positive problem when the calculated delay was less than 0 and the -m was not set. Fixed the problem where slaves would alert due to deadlocks on the master. Disabled UNK alerts by default (it is possible to enable them explicitly). A fix was added for MySQL Multi-Source replication. of SHOW ENGINE INNODB STATUS has changed in MySQL 5.7 (see https://dev.mysql.com/doc/refman/5.7/en/innodb-standard-monitor.html). Added server @@hostname as a possible match to avoid DNS lookups while allowing hostname-match. A new tarball is available from downloads area or in packages from our software repositories. The plugins are fully supported for customers with a Percona Support contract and free installation services are provided as part of some contracts. You can find links to the documentation, forums and more at the project homepage. Percona Monitoring Plugins are monitoring and graphing components designed to integrate seamlessly with widely deployed solutions such as Nagios, Cacti and Zabbix. I think the biggest news from last week was from cPanel – if you haven’t already read the post, please do – on Being a Good Open Source Community Member: Why we hesitated on MySQL 5.7. cPanel anticipated MariaDB being the eventual replacement for MySQL, based on movements from Red Hat, Wikipedia and Google. The advantage focused on transparency around security disclosure, and the added features/improvements. Today though, “MySQL now consistently matches or outpaces MariaDB when it comes to development and releases, which in turn is increasing the demand on us for providing those upgraded versions of MySQL by our users.” And maybe a little more telling, “when MariaDB 10.2 became stable in May 2017 it included many features found in MySQL 5.7. However, MySQL reached stable nearly 18 months earlier in October 2015.” (emphasis mine). I, of course, think this is a great move. Users deserve choice. And MySQL has features that are sometimes still not included in MariaDB Server. Have you seen the Complete list of new features in MySQL 5.7? Or my high-level response to a MariaDB Corporation white paper? I can only hope to see more people think pragmatically like cPanel. Ubuntu as a Linux distribution still does – you get MySQL 5.7 as a default (very unlike the upstream Debian which ships MariaDB Server nowadays). I used to be a proponent of MariaDB Server being everywhere, when it was community-developed, feature-enhanced, and backward-compatible. However, the moment it stopped being a branch and a true fork is the moment where trouble lies for users. I think it was still marginally fine with 10.0, and maybe even 10.1, but the ability to maintain feature parity with enhanced features has long gone. Short of a rebase? But then… what would be different to the already popular branch of MySQL called Percona Server for MySQL? While there are wins and support from cloud vendors, like Amazon AWS RDS and Microsoft Azure, you’ll notice that they offer both MySQL and MariaDB Server. Google Cloud SQL notably only offers MySQL. IBM may be a sponsor of the MariaDB Foundation, but I don’t see their services like Compose offering anything other than MySQL (with group replication nonetheless!). Platinum member Alibaba Cloud offers MySQL and PostgreSQL. However, Tencent seems to suggest that MariaDB is coming soon? One interesting statistic to watch would be user uptake naturally. From an events standpoint, the Percona Live 2018 Call for Papers has been extended to January 12, 2018. We expect an early announcement of maybe ten talks in the week of January 5. Please submit to the CFP. Have you got your tickets yet? Nab them during our Percona Live 2018 super saver registration when they are the best price! FOSDEM has got Sveta and myself speaking in the MySQL and Friends DevRoom, but we also have good news in the sense that Peter Zaitsev is also going to be at FOSDEM – speaking in the main track. We’ll also have plenty of schwag at the stand. I think it’s important to take note of the updates to Percona bug tracking: yes, its Jira all the way. Would be good for everyone to start also looking at how the sausage is made. Dragph, a “distributed fast graph database“, just raised $3m and released 1.0. Have you used it? On a lighter note, there seems to be a tweet going around by many, so I thought I’d share it here. Merry Christmas and Happy Holidays. SQL Claus is coming to town! ProxySQL 1.4.4 – some interesting features include bandwidth throttling, limit connections to backends, monitoring replication lag, and more. MariaDB Server 10.2 is in CentOS 6 and CentOS 7 via Software Collections. Good presentation on multi-user Presto usage. You probably must be dabbling with containers, so Google released container-diff, a tool for quickly comparing container images. Check it out on GitHub. James Governor (RedMonk), writes On AWS and Pivotal, opinions and overlaps. Apache Cassandra users, should you use incremental repair? There are certain peak times of the year where companies worldwide hold their breath in the hope that their databases do not become overloaded or unresponsive. A large percentage of yearly profits are achieved in a matter of hours during peak events. It is critical that the database environment remains online and responsive. According to a recent survey, users will not wait more than 2.5 seconds for a site to load before navigating elsewhere. Percona has partnered with many clients over the years to ensure success during these critical events. Our goal is always to provide our clients with the most responsive, stable open-source database environments in order to meet their business needs. In this blog post, we are going to take a closer look at what happened during Black Friday for a high-demand, high-traffic, business-critical application. Pepper Media Holding runs global deals sites where users post and vote on top deals on products in real-time. 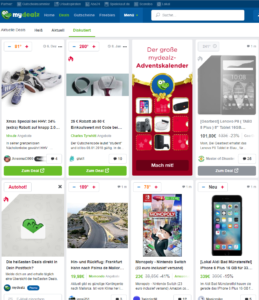 To give you a better idea of what the user sees, there is a screenshot below from their Germany mydealz.de branch of Pepper Media Holding. As you can imagine, Black Friday results in a huge spike in traffic and user contribution. In order to ensure success during these crucial times, Pepper Media Holding utilizes Percona’s fully managed service offering. Percona’s Managed Services team has become an extension of Pepper Media Holding’s team by helping plan, prepare, and implement MySQL best-practices across their entire database environment. Pepper Media Holding and Percona thought it would be interesting to reflect on Black Friday 2017 and how we worked together to flourish under huge spikes in query volume and user connections. Below is a graph of MySQL query volume for Germany servers supporting the mydealz.de front-end. This graph is taken from Percona’s Managed Service Team’s installation of Percona Monitoring and Management (PMM), which they use to monitor Pepper Media’s environment. As to be expected, MySQL query volume peaked shortly before and during midnight local time. It also spiked early in the morning as users were waking up. The traffic waned throughout the day. The most interesting data point is the spike from 5 AM to 9 AM which saw an 800% increase from the post-midnight dip. The sustained two-day traffic surge was on average a 200% increase when compared to normal, day-to-day query traffic hitting the database. For more statistics on how the mydealz.de fared from a front-end and user perspective, visit Pepper Media Holding’s newsroom where Pepper Media has given a breakdown of various statistics related to website traffic during Black Friday. Another popular Pepper Media Holding branch is in the United Kingdom – better known as HotUKDeals. 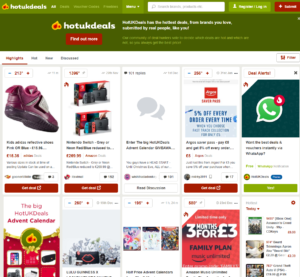 HotUKDeals hosts user-aggregated and voted-on deals for UK users. This is the busiest Pepper Media Holding database environment on average. Below is a screenshot of the user interface. The below graphs are from our Managed Service Team’s Percona Monitoring and Management installation and representative of the UK servers supporting the HotUKDeals website traffic. The first graph we are taking a look at is MySQL Replication Delay. As you can see, the initial midnight wave of Black Friday deals caused a negligible replica delay. The Percona Monitoring and Management MySQL Replication Delay graph is based on seconds_behind_master which is an integer value only. This means the delay is somewhere between 0 and 1 most of the time. Only once did it go between 1 and 2 over the entire course of Black Friday traffic. The below graphs highlight the MySQL Traffic seen on the UK servers during the Black Friday traffic spike. One interesting note with this graph is the gradual lead-up to the midnight Black Friday spike. It looks like Black Friday is overstepping its boundaries into Gray Thursday. The traffic spikes here mimic the ones we saw in Germany. There’s an initial spike at midnight on Black Friday and then another spike as shoppers are waking up for their day. The UK servers saw a 361% spike in traffic the morning of Black Friday. MySQL connections also saw an expected and significant spike during this time. Neglecting to consider max_connections system parameter during an event rush might result in “ERROR 1040 (00000): Too many connections.” However, our CEO, Peter Zaitsev, cautions against absent-mindedly setting this parameter at an unreachable level just to avoid this error. In a blog post, he explained best-practices for this scenario. The MySQL query graph below shows a 400% spike in MySQL queries during the peak Black Friday morning traffic rush. The average number of queries hitting the database over this two day period is significantly higher than normal – approximately 183%. Percona reported no emergencies during the Black Friday period for its Managed Service customers – including Pepper Media Holding. We saw similarly high traffic spikes among our customers during this 2017 Black Friday season. I hope that this run-down of a few PMM graphs taken during Pepper Media Holding’s Black Friday traffic period was informative and interesting. Special thanks to Pepper Media Holding for working with us to create this blog post. Note: Check out our Pepper Media case study on how Percona helps them manage their database environment. If you would like to further explore the graphs and statistics that Percona Monitoring and Management has to offer, we have a live demo available at https://pmmdemo.percona.com. To discuss how Percona Managed Services can help your database thrive during event-based traffic spikes (and all year round), please call us at +1-888-316-9775 (USA), +44 203 608 6727 (Europe), or have us contact you. This post is a hands-on look at ZFS with MySQL. In my previous post, I highlighted the similarities between MySQL and ZFS. Before going any further, I’d like you to be able to play and experiment with ZFS. This post shows you how to configure ZFS with MySQL in a minimalistic way on either Ubuntu 16.04 or Centos 7. In order to be able to use ZFS, you need some available storage space. For storage – since the goal here is just to have a hands-on experience – we’ll use a simple file as a storage device. Although simplistic, I have now been using a similar setup on my laptop for nearly three years (just can’t get rid of it, it is too useful). For simplicity, I suggest you use a small Centos7 or Ubuntu 16.04 VM with one core, 8GB of disk and 1GB of RAM. After the installation, I have ZFS version 0.6.5.6 on Ubuntu and version 0.7.3.0 on Centos7. The version difference doesn’t matter for what will follow. If you have a result similar to the above, congratulations, you have a ZFS pool. If you put files in /mysqldata, they are in ZFS. [root@Centos7 ~]# mysql -p -e "ALTER USER 'root'@'localhost' IDENTIFIED BY 'Mysql57OnZfs_';"
mysql will be the top level filesystem for the MySQL related data. This filesystem will not directly have data in it, but data will be stored in the other filesystems that we create. The utility of the mysql filesystem will become obvious when we talk about snapshots. Something to keep in mind for the next steps, the properties of a filesystem are by default inherited from the upper level. mysql/data will be the actual datadir. The files in the datadir are mostly accessed through random IO operations, so we’ll set the ZFS recordsize to match the InnoDB page size. mysql/log will be where the log files will be stored. By log files, I primarily mean the InnoDB log files. But the binary log file, the slow query log and the error log will all be stored in that directory. The log files are accessed through sequential IO operations. We’ll thus use a bigger ZFS recordsize in order to maximize the compression efficiency. [root@Centos7 ~]# semanage fcontext -a -t mysqld_db_t "/var/lib/mysql-log(/.*)?" I could have just disabled selinux since it is a test server, but if I don’t get my hands dirty on selinux once in a while with semanage and chcon I will not remember how to do it. Selinux is an important security tool on Linux (but that’s another story). At this point, feel free to start using your test MySQL database on ZFS. I really invite you to further experiment and get a feeling of how ZFS and MySQL behave together. The data in the SLOG is critical for ZFS recovery. I performed some tests with virtual machines, and if you crash the server and lose the SLOG you may lose all the data stored in the ZFS pool. Normally, the SLOG is on a mirror in order to lower the risk of losing it. 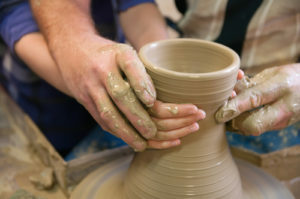 The SLOG can be added and removed online. I know I asked you to promise to never use an shm file as SLOG in production. Actually, there are exceptions. I would not hesitate to temporarily use such a trick to speed up a lagging slave. Another situation where such a trick could be used is with Percona XtraDB Cluster. With a cluster, there are multiple copies of the dataset. Even if one node crashed and lost its ZFS filesystems, it could easily be reconfigured and reprovisioned from the surviving nodes. It takes the echo command to drop_caches to force a re-initialization of the ARC. Now, InnoDB data starts to be cached in the L2ARC. The way data is sent to the L2ARC has many tunables, which I won’t discuss here. I chose 64MB for the ARC size mainly because I am using a low memory VM. A size of 64MB is aggressively small and will slow down ZFS if the metadata doesn’t fit in the ARC. Normally you should use a larger value. The actual good size depends on many parameters like the filesystem system size, the number of files and the presence of a L2ARC. You can monitor the ARC and L2ARC using the arcstat tool that comes with ZFS on Linux (when you use Centos 7). With Ubuntu, download the tool from here. With this guide, I hope I provided a positive first experience in using ZFS with MySQL. The configuration is simple, and not optimized for performance. However, we’ll look at more realistic configurations in future posts. Percona announces the release of Percona Server for MongoDB 3.2.17-3.8 on October 31, 2017. Download the latest version from the Percona web site or the Percona Software Repositories. Percona Server for MongoDB is an enhanced, open-source, fully compatible, highly scalable, zero-maintenance downtime database that supports the MongoDB v3.2 protocol and drivers. It extends MongoDB with MongoRocks, Percona Memory Engine and PerconaFT storage engine, as well as enterprise-grade features like External Authentication, Audit Logging, Profiling Rate Limiting, and Hot Backup at no extra cost. The software requires no changes to MongoDB applications or code. NOTE: The PerconaFT storage engine is deprecated as of 3.2. It is no longer supported and isn’t available in higher version releases. This release is based on MongoDB 3.2.17 and does not include any additional changes. The Percona Server for MongoDB 3.2.17-3.8 release notes are available in the official documentation. 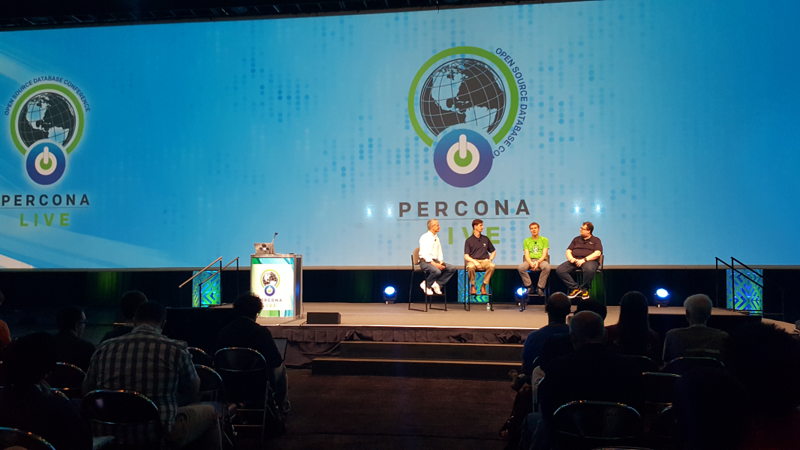 Percona announces the release of Percona Server for MongoDB 3.2.16-3.7 on September 27, 2017. Download the latest version from the Percona web site or the Percona Software Repositories. NOTE: The PerconaFT storage engine is deprecated as of 3.4. It is no longer supported and isn’t available in higher version releases. #PSMDB-164: Fixed MongoRocks failure to repair if database metadata is inconsistent with dropped collections and indexes. Added packages for Debian 9 (“stretch”). The Percona Server for MongoDB 3.2.16-3.7 release notes are available in the official documentation. To analyze workload, I’ll use an Apache log file from one of Percona’s servers. The log has 1.56 billion rows, and uncompressed it takes 274G. When inserted into ClickHouse, the table on disk takes 9G. where $i is (N CPUs-1). We must also take into account that not all queries are equal. Some are easier to execute in parallel than others. So I will test three different queries. In the end, we can’t get around Amdahl’s Law! 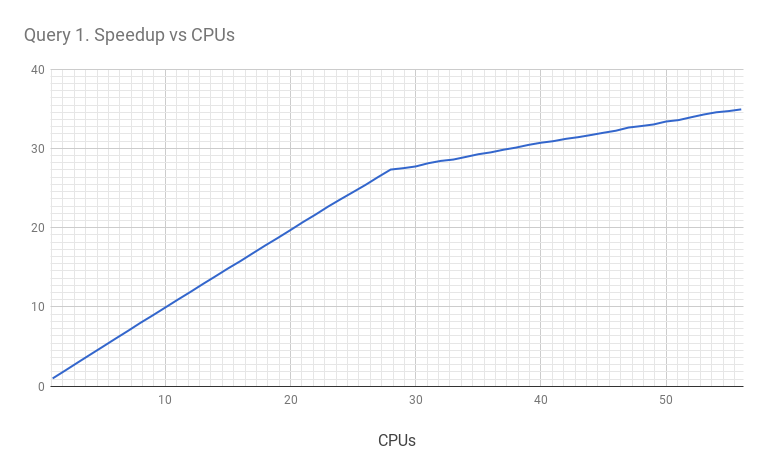 From the chart, we can see that the query scales linearly up to 28 cores. After that, it continues to scale up to 56 threads (but with a lesser slope). I think this is related to the CPU architecture (remember we have 28 physical cores and 56 CPU “threads”). Let’s look at the results again. 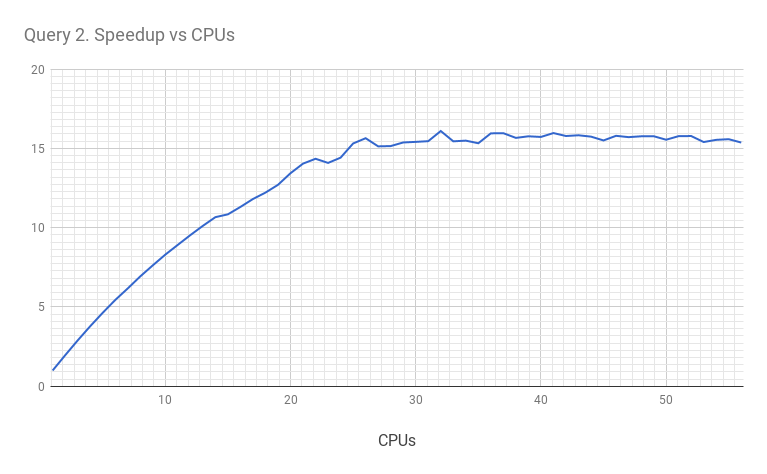 With one available CPU, the query took 823.6 sec to execute. With all available CPUs, it took 23.6 sec. So the total speedup is 34.9 times. This query uses aggregation that counts unique URIs, which I am sure limits the counting process to a single shared structure. So some part of the execution is limited to a single process. I won’t show the full results for all 1 to 56 CPUs, but for one CPU the execution time is 177.715 sec, and for 56 CPUs the execution time is 11.564 sec. The total speedup is 15.4 times. In that query, we build a derived table (to resolve the subquery) and I expect it will limit the parallelism even further. 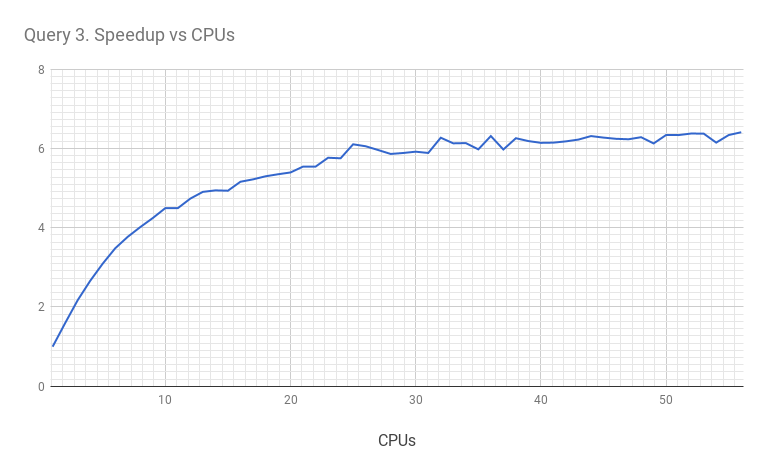 And it does: with one CPU the query takes 183.063 sec to execute. With 56 CPUs it takes 28.572 sec. So the speedup is only 6.4 times. However, if query execution is serial, it limits the speedup (as described in Amdahl’s Law). One example is a 1.5 billion record Apache log, and we can see that ClickHouse can execute complex analytical queries within tens of seconds.